Use iMediChart.com to organize your own vital medical information online. It can save your life in case of emergency (ICE). In Case of Emergency (ICE), are your prepared? Organize your own vital information like, emergency contacts, allergies, immunizations, medications, doctors list, doctor office visits, medical devices, and procedures using simple to use state of the art system developed by iMediChart.com. Get your own personalized ICE cards that you can carry in your wallet and your key chain. In case of emergency, Emergency Responders and/or Doctors may be able to glean information from your ICE cards and online personal health records to save your life. You have total control on what you want and how much you want to store in our system. Your privacy is our top priority. If you have any questions or concerns about your privacy, please click here to check our PRIVACY STATEMENT. Whether you are an individual or a family, iMediChart can offer you the peace of mind by providing you an avenue to manage your "Personal Health Records (PHR)" online. Click here to sign up today and get your own personalized ICE card. iMediChart is a user maintained online repository of vital medical information. Subscribers can easily and efficiently manage their electronic medical records (either by themselves or by their Doctors) using easy to use iMediChart system. The information stored on our secure iMediChart system may come in handy during emergencies or Doctor office visits and reduce medical mistakes where no other patient data is available. Medical mistakes are not only expensive but can also cost lives. Based on our personal experience and publicly available data, we have realized a lot of medical mistakes happen in the emergency rooms due to lack of readily available medical information. If you are a subscriber of this product and you end up in an emergency room, the ER Doctors may be able to access some of your vital records stored in our system. For example, your allergy, medical condition, or emergency contact information. Having access to such invaluable information will help the ER specialist to contact your dear ones or quickly perform the necessary ER procedures based on your up to date electronic medical records found on our system. That could lead to less medical mistakes and could eventually save your life. Another big benefit of this product will be during your Doctor office visits. Most of the times if you go to a new Doctor, you will be asked to fill a new patient information form. With iMediChart, all you need to do is print out your vital medical information summary and hand it over to the Doctor's office. Or you can give access to your iMediChart account to your Doctor and Doctor will be able to retrieve it right from his office. As some of your important medical records are maintained electronically, you do not have to remember your or your family member's information every time you go to the Doctor's office. That not only saves money and effort, but can also reduce medical mistakes. There are various other places where iMediChart could come in handy. Click here to register and start using our service. Saves lives in case of emergency (ICE). 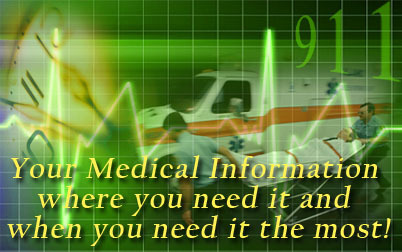 Easy retrieval of Medical Info anywhere, anytime 24 x 7. Your medical information is secure and completely confidential. one place and retrieve them when needed. 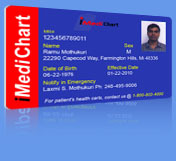 Step 2: Login in to add your vital medical information and receive your own iMediChart health cards (wallet size and key tags).